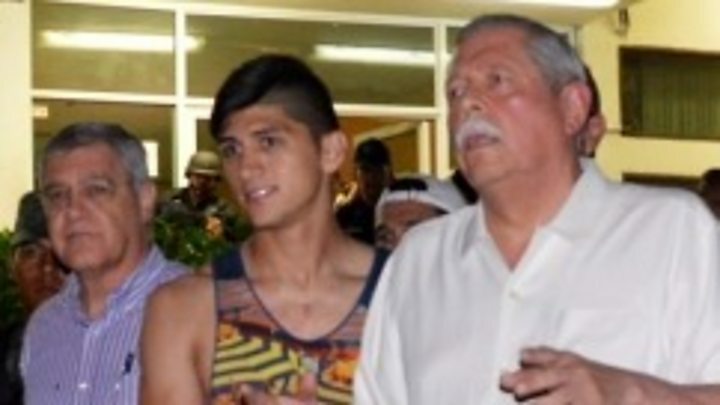 International football player Alan Pulido is "safe and sound" after police rescued him from kidnappers who seized him in north-eastern Mexico. The striker, who plays for Greek team Olympiakos, phoned police while his captors were distracted, officials say. A 38-year-old man has been arrested. Officials say he confessed to belonging to a local criminal gang. Police are searching for another three men believed to have been involved in the kidnapping. Pulido's car was surrounded by several vehicles as he was leaving a party with his girlfriend on Saturday night. Masked men took him away, leaving his girlfriend unharmed in the car park where the incident took place. Pulido's family received a phone call on Sunday demanding a ransom payment, state prosecutor Ismael Quintanilla told journalists. It is not clear whether the family were planning to meet the kidnappers' demands or how big the ransom demand was. Mr Quintanilla said that the security forces were able to locate Pulido thanks to the phone call he managed to make to police. He said no shots had been fired and Pulido only sustained a minor injury. Others argue that the true figure could be almost 10 times as high.